Break-through on Commercial Property Taxes? 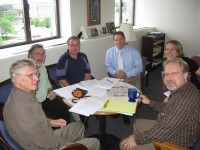 Members of the NDDC’s E R Team traveled to St. Paul once again to meet with legislators on the property tax issue. After years of meetings, it really feels like we’re finally making some progress. Representative David Bly set up a meeting for us with Representative Paul Marquart (House District 09B). Representative Marquart is Chair of the Property Tax Relief Committee. We didn’t even know such a committee existed but you can imagine our excitement when we arrived at an office decorated with slogans critical of ever-rising property taxes. Seated around the table are NDDC Board Secretary Keith Covey, NDDC Executive Director Ross Currier, NDDC Vice President Joe Grundhoefer, Representative Paul Marquart, Legislation Consultant Laura Sayles, and Representative David Bly. The discussion was fast-paced. We discussed three possible methods for addressing the issue, one that focuses on historic commercial districts in Greater Minnesota and two that address the broader issue of commercial property taxation. A legislative work group will meet and evaluate the three options and recommend legislation. Our plan is to reconvene in two weeks, the legislation should be drafted in the next month or so, we’ll circulate it throughout Greater Minnesota this summer and fall, and the bill will be introduced to the Legislature in January. As I said earlier, it really feels like we’re making some progress now.